how to get their son or daughter an athletic basketball scholarship to help pay for college. In fact, very few high school coaches even know enough to help a great college-bound athlete get recruited – beyond pointing them out to a few college coaches they personally know. Athletes who should have been recruited graduate … unrecruited. Find out how basketball athletic recruiting really works. 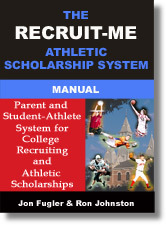 You can learn the secrets to getting recruited from Jon Fugler & Ron Johnston, co-Authors of The Recruit-Me Athletic Scholarship System. They’ll show you how to run your own campaign using their step-by-step recruiting system – for a fraction of the cost of a recruiting service or consultant. There are a lot of companies out there that promise you will get recruited by using their services, but as I always recommend you can do so much better by doing it yourself. Only you know how to “market” yourself! I am Nathan Robinson age at 21 year old. i am 6 ft 0 inches. all my life i wanted to play basketball i got award in high school i got 2 year straight best man inside. and average 17 point per game in my senior year. now i am a college student but i want to play for my country Italy. so please i would love to play for them. so please contact me at lebronjames31@gmail.com or call me at 401-536-5249. I want to play in the NBA but i know i have to get a college first,i don’t know if anybody can assist me.I have been playing in college in Kenya but the standards are not that high and i want to further my career. My name is Vasily Prokofiev, i’m basketball player from Russia who is lookoing for a college in the US to enter by sport schoolarship! I’ve made some game highlights from one of my games, so you may watch it here! You can also find game stats below. You may contact me via e-mail. My name is Gabriel Tembo,I am 1.75m tall & 75kg.I have just completed high school where i won best basketball player award.I was captain and under my captainship we won the national trophy in the annaul ISAZ competition.I would love to get a scholarship tohelpe brighten my future n make my family,country & continent proud.By God’s grace I wluld like somebody to help me have a career.Please help and I Promise i wont let you down. My name is Oluwadamilola Atunwa,I am 6’3ft tall have just completed high school where i won best basketball player award.I was captain and under my captainship we won the national trophy in the annaul Milo competition.I would love to get a scholarship tohelpe brighten my future n make my family,country & continent proud.By God’s grace I wluld like somebody to help me have a career.Please help and I Promise i wont let you down.